Tampa Child Custody Lawyers | Caveda Family Law Firm, P.A. Divorce and family conflicts are always emotionally draining and stressful for everyone involved, and that includes the innocent bystanders-children. Children are extremely curious about the world around them, and often have questions and concerns that they aren’t sure how to express, and that you aren’t prepared to answer. By speaking with an experienced child custody attorney, you are able to have a firm understanding of the process, allowing you to address those hard questions and set your children’s mind at ease. At Caveda Law Firm, P.A., we provide complete support throughout all aspects of divorce, including providing solutions that allow both parents to have an ongoing and loving relationship with their children. Florida child custody consists of two separate and distinct elements- parental responsibility and time-sharing. 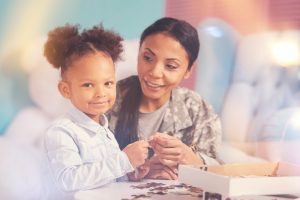 Parental responsibility determines the decision-making rights of each parent regarding childcare, education, healthcare, and other major life decisions. The ideal situation would involve both parents working together to make these choices. However, that is not the right solution for every case. Time-sharing determines the physical time a child has with each parent, determined on a case-by-case basis. Every family has unique needs and schedules, and the court prefers the two parents to determine a time-sharing arrangement that works best for them prior to appearance in court. Your time-sharing arrangement can play a role in other factors, such as support or parental responsibility. If one parent spends a substantially larger portion of time with the child, then they may also receive a higher level of child support or may get more responsibility regarding decision making on the child’s behalf. The child custody attorneys of Caveda Law Firm, P.A. help you create a time-sharing plan that works for you and actively protects your rights to equal time with your child. An unmarried father’s rights are more challenging to obtain. We can help there as well. In Florida, divorcing couples with minor children must address the issue of the physical custody of their child or children. This issue should not be confused with the issue of Shared Parental Responsibility (legal custody), which is awarded to both parents in the vast majority of cases and which gives each parent the same right to participate in making important decisions affecting their children in areas such as education, medical care, religious upbringing, etc. In most cases, the parents come to an agreement as to which parent will be the primary residential parent together with an agreement as to the minimum visitation, or timesharing, rights of the secondary residential parent. Settlement of this issue affords the parties the ability to control and make decisions about this very important and personal aspect of their lives, rather than turning control over to a judge. In addition, the parties will save a considerable amount of money if they can avoid litigation over custody issues. In those cases where the parties cannot reach an agreement, the court system stands ready, willing and able to make this decision for the parties. In arriving at its decision regarding custody, Florida courts are primarily concerned with the “best interests” of the child. The parent who is more likely to allow the child frequent and continuing contact with the other parent. The love, affection, and emotional ties existing between the parents and the child. The capacity and ability to meet the child’s material needs. The length of time the child has lived in a stable, satisfactory environment, and the desirability of maintaining stability. The permanence, as a family unit, of the current or new custodial home. After the custody determination is made by the judge an order is signed and filed with the Clerk of Court. Both parents are immediately bound by the judge’s decision, although the parties can ask the judge to reconsider his or her ruling and they can also appeal the judge’s ruling to Second District Court of Appeal. We look forward to helping you put your life together with effective legal support and guidance through these challenging times. Every parent has the right to a relationship with their children, just as every child deserves 2 loving parents. From custody orders to modification and enforcement, Caveda Law Firm, P.A. is your Tampa child custody law firm. Call Caveda Law Firm, P.A. today at (813) 336-5690 for a Free Consultation with a dedicated, experienced child support attorney.